UGLI fruits are named after their appearance which is generally discolored, pot-marked and odd-shaped. Ugli fruit really are ugly! However, it gets a bad rap; it really has a very sweet, citrus taste, is peeled easily and is seedless, making it a great snack or addition to salads. The outside is a greenish-yellow color and has a shape that is between an orange and a pear. 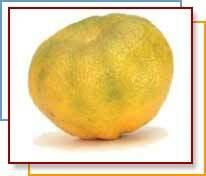 The name UGLI is a registered trademark of Cabel Hall Citrus Ltd. the Jamaican distributor of the fruit. The fruit was a chance seedling discovered in 1924 in Jamaica and developed by F.G. Sharp of Trout Hall Ltd. It is said to be a cross between a Seville orange, grapefruit and tangerine (mandarin) . Most authorities agree with the tangerine as one of the sources, but there is disagreement on the other citrus fruits involved. They are classified as a tangelo variety. The Ugli ranges in size from an orange to a large grapefruit with a thick, tough, puffy, somewhat loosely fitting skin that is easily peeled. They are very juicy, with large yellow-orange pulp sections usually with very few seeds. They are said to combine the best qualities of tangerines, grapefruit and Seville oranges. Children love the bright acid sweet taste and their intriguing name. Choose fruits that are heavy and have no sign of drying at the ends. The fruit should give with slight pressure much like grapefruit. Color is not important when choosing, and pot-marks and small dents are normal. Uglis can be kept at room temperature for about 5 days, or in the refrigerator for up to 2 weeks. Uglis should not be cooked or it will lose flavor. Make UGLI Fruit part of your 5 to 9 A Day Plan! 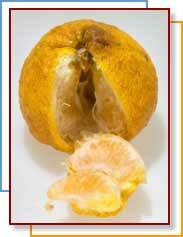 -- Uglis are easily peeled, and can be eaten like a tangerine. -- Cut in half and spooned out like a grapefruit. -- Uglis are a good addition to fruit salads.